6+1 pieces value pack > save on shipping + get one soap for FREE! This SUPERSTUFF old school raw soap is best FOR BODY, HANDS AND FEET. Made from raw native grasses mix. Peeling and scrubbing it helps regenerate your skin. Hand cooked in Europe from raw goat milk following the old school natural recipe: natural oils and fats, lye, water, glycerin, raw native grasses mix. 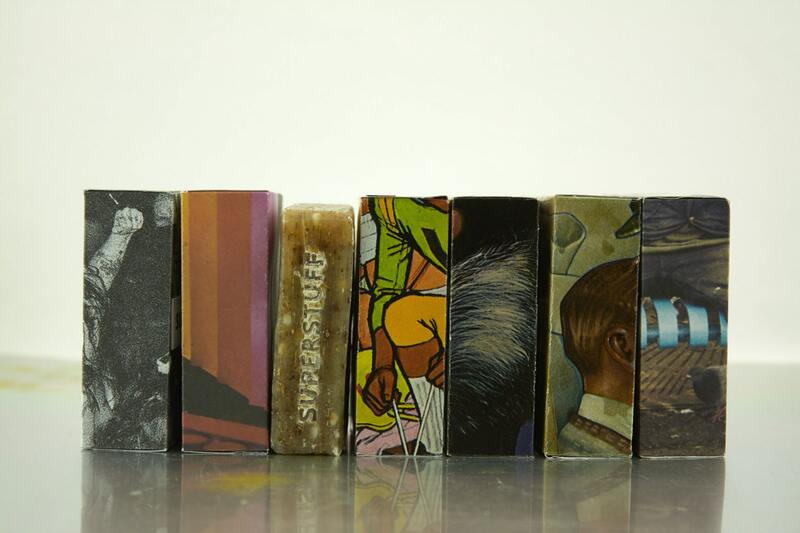 Weight of each soap brick: 100g.±10% (3.5 oz.±10%). Every SUPERSTUFF soap brick is handcrafted, so the form, texture, weight and color may vary from piece to piece. Each package is made from a sheet of recycled magazine paper, so the design is unique for each package. SUPERSTUFF is an experiment. Of how to start a family "for-benefit" business with just $100 budget. We are a family originated from Belarus - a rustic country in the fringes of Europe famous for their purest lakes, dense forests and agritourism. Our challenge is to start our own family business having just $100 budget and to found one day the "for-benefit" corporation in a downtown of New York City where we are dreaming to move to. We try to live natural, health-forward and sustainable. All of us abandoned shampoo and shower gels a long time ago because of their artificial and even harmful contents. So we are doing soaping as a family hobby for many years following the old school grandparents recipes. Those we decided to start SUPERSTUFF from our 3 essential raw soaps. We understand that having just $100 budget we couldn't launch our own manufacture with all the tools, licences and certificates needed. So we found a small countryside manufacturer who handcraft soaps using old school techniques and who agreed to make a very small first production run following our own recipe. In some days we got our first samples. Nicole was so impressed so she exclaimed “Papa, mama, that's a SUPER soap!!!". So that's how the brand name was defined. As we are planning to produce not just soaps, we name our brand SUPERSTUFF. We like packaging to be simple and sustainable. So the idea was to collect and recycle paper sheets from periodic magazines from local barbershops and beauty salons. Trying to be lean and not to surpass the $100 budget we make all the startup jobs using our own skills. Sometimes we were forced to learn new tricks by asking Google to help us. TEMPLATEMAKER.nl helps us to make the packaging template at a free of cost. Using SQUARESPACE.com and ETSY.com we build our website and online shop. To make the product photos we craft a self-invented lightbox using Nicole's drawing table and 3 salvage ceiling fluorescent lamps bought in flea market for just $2 each. We shoot photos on a cheap Canon Rebel T2i with a kit lens camera we borrowed for free from our friend Max who is not using it anymore because of his iPhone. After everything was set up, we start to thinking about the "for-benefit" distribution model. We decided to partner with barbershops and beauty salons all around the world who are willing to recycle their used magazines and to use our soaps instead of shampoo. We agreed to give them free individual one-off soap samples in exchange for a free store shelf space. So their customers could trial to use soap instead of shampoo and buy SUPERSTUFF with no distribution, retail and shipping margins. The second model is to ship our soaps to the home goods stores and concept stores who agree to donate $1 from each SUPERSTUFF item sold to a local charity organization of our choice. And the third model is to sell soap directly from our website and ETSY giving a free soap from each one sold for people in need. We are a very small business now, so please, if you like SUPERSTUFF, get some old school raw soap bricks, follow us and spread the word. Thank you! 3 pieces bundle pack > save on shipping! For body, hands and feet. Made from raw native grasses mix. For hair, beard and face. Made from raw goat milk. For armpits. Made from raw birch tar. I have tried multiple times to contact the seller with no response. I have yet to receive my item which I purchased in May.